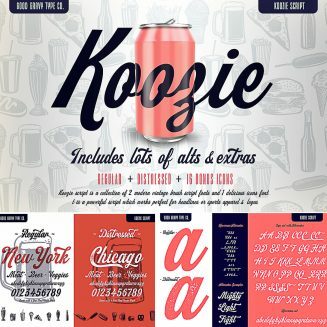 Introducing Koozie Script – a collection of 2 modern vintage brush script fonts and 1 delicious icons font. It is a powerful script which works perfect for headlines or sports apparel and logos. Tags: brush lettering, casual, cursive font, headline, icon font, label font, lettering, script, script font, sport, swash.